Revision Military BATLSKIN (“Battle Skin”) Modular Head Protection System (MHPS) Lightweight Ballistic Combat Helmet, Visor and Mandibular Guard/Ballistic Face Shield: Complete Ballistic Maxillofacial Protection (Facial Armor) for the 21st Century Warfighter | DefenseReview.com (DR): An online tactical technology and military defense technology magazine with particular focus on the latest and greatest tactical firearms news (tactical gun news), tactical gear news and tactical shooting news. Revision Military recently released photos and info on the Revision Military BATLSKIN (Pronounced "Battle Skin") Modular Head Protection System (MHPS) (formerly Revision Modular Protective Attachment System, or Revision MPAS) lightweight ballistic combat helmet, visor and (ballistic) mandibular guard/maxillofacial (lower face and jaw) protection system, which is a total craniofacial armor solution. The end result of a 3-year contract to develop the U.S. Army’s next-generation head protection system for the combat element of the 3-block war model, the BATLSKIN MHPS lightweight ballistic helmet/visor/mandible guard system looks pretty cool and well designed as ballistic helmets and face shields go, and mandibular/facial protection would seem like a good thing on paper, but DefenseReview (DR) is curious as to how conducive the system is to dynamic combat shooting under stress, particularly during CQB/CQC (Close Quarters Battle/Close Quarters Combat) scenarios, how hot it gets under there in warm-to-hot environments, and whether or not the visor and mandibular portions can be integrated with the Ops-Core FAST Ballistic Helmet and/or Crye Precision AirFrame Helmet. Probably not (unconfirmed/unverified). Also, how well does it integrate with an advanced tactical coms headset (tactical communications headset) like the Atlantic Signal Dominator bone-conduction/hearing pro tactical headset system? You'd obviously have to remove the BATLSKIN MHPS visor and mandibular guard to don the Avon Protection Systems (APS) M53 CBRN Mask (Gas Mask)/Respirator, which integrates with the Dominator. And, while we're at it, what functionally differentiates the BATLSKIN MHPS helmet/mandible guard combo from the ACH/GENTEX Ballistic Protective Maxillofacial Shield (MFS), which has been in use for the last several years? Also, how do those two systems stack up functionally against the Crye Precision AirFrame Helmet/Chops(or as we like to call them, "mutton chops") combo. The Revision BATLSKIN Modular Head Protection System lightweight combat helmet and mandible guard's coloration and hexagonal pattern finish/paint job are nice touches, but the proof will be in the proverbial pudding. Military assaulters/operators will be the judges, juries, and executioners of the this system. Again, maxillofacial protection is a nice idea in theory (i.e., on paper), and maybe even in reality for general infantry forces provided it doesn't interfere with a good cheek weld on one's carbine/rifle stock and a a good, fast sight picture, doesn't weigh the soldier's head down, and isn't uncomfortable to wear. We'll tell you what, the developers would be well advised to develop an active cooling system for BATLSKIN. Until then, just from the looks of things, the AirFrame Chops (we actually handled and photographed these at SHOT Show 2011) would appear to offer the most passive cooling ventilation and be the most lightweight maxillofacial protection solution (unconfirmed/unverified), but the Revision Batlskin MHPS mandible guard and GENTEX MFS would appear to offer more extensive and sturdy mandibular/maxillofacial protection. Just remember that none of these products offer more than NIJ Level IIIA ballistic protection (9mm NATO/.44 Magnum), but then again, neither does the BATLSKIN lightweight helmet or ACH (Advanced Combat Helmet) to which they're respectively attached. Maxillofacial protection for soldiers isn't exactly a new or original concept. The Greeks and Romans developed and utilized it in combat thousands of years ago, but combat-viable maxillofacial ballistic protection in the modern ballistic era (since the development of gun powder) is a relatively new development, since it requires lightweight, shapable ballistic armor technology that can stop bullets and shrapnel. It'll be interesting to see whether or not products like the Batlskin MHPS and MFS catch on with general infantry forces en masse. DR is skeptical about this. Once the Revision Military BATLSKIN MHPS maxillofacial aspect (mandible guard) has been attached to the helmet, the complete Batlskin helmet system looks like a rice rocket motorcycle helmet, and DefenseReview isn't sure we'd want to be running and gunning with a motorcycle helmet on our heads. We'd have to try it, though, and we'll of course keep an open mind. 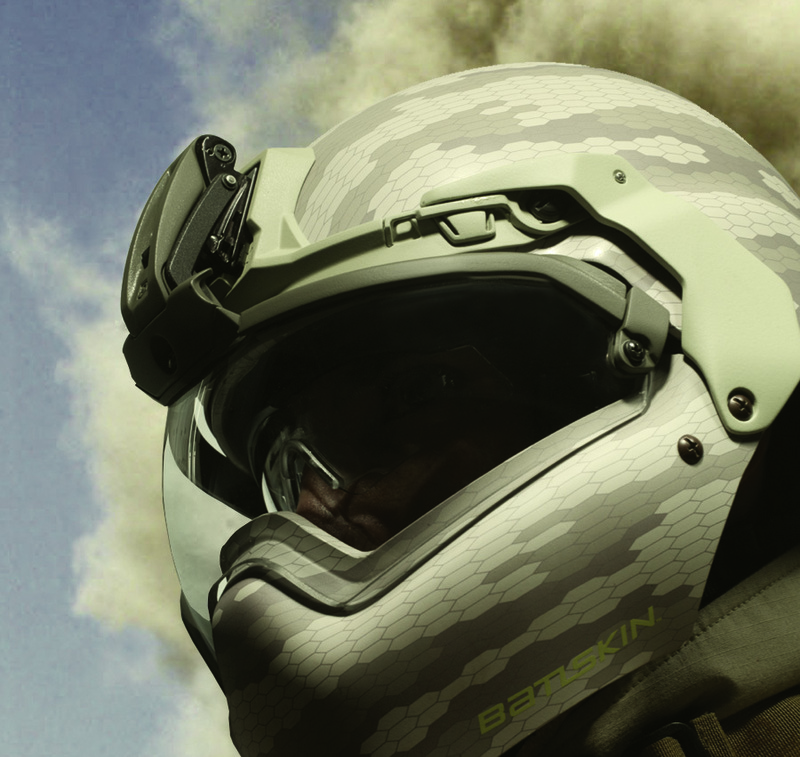 RomeoTangoBravo has voiced concern about the Batlskin visor fogging, which would appear to be a valid concern, regardless of the environment in which a soldier/warfighter is operating. Even tactical eyepro/eyewear with good ventilation can fog up on you, let alone a visor on an enclosed system with the mandible guard deployed. If the Batlskin helmet system ends up being actively cooled at some point per DR's suggestion, fogging will still be an issue. If active cooling is implemented, an active counter-fogging system that controls the temperature on both sides of the visor might also be necessary and/or advisable. In the meantime we're going to ask our U.S. military Special Operations contacts what they think of it for use by SOF forces, and/or by general infantry personnel, respectively. We may get two separate answers, or one answer, and we have no idea how that answer's gonna' go. 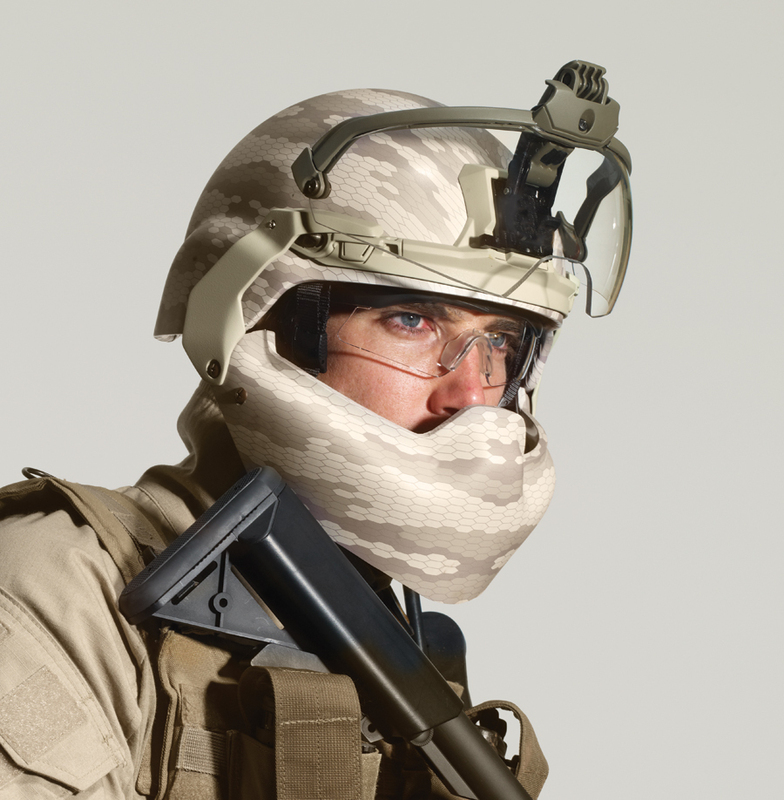 "09.12.2011– Montreal, QC, Canada – Revision Military, the recognized global leader in ballistic and laser eye protection, launches into the head protection arena with the introduction of its new Batlskin Head Protection System. 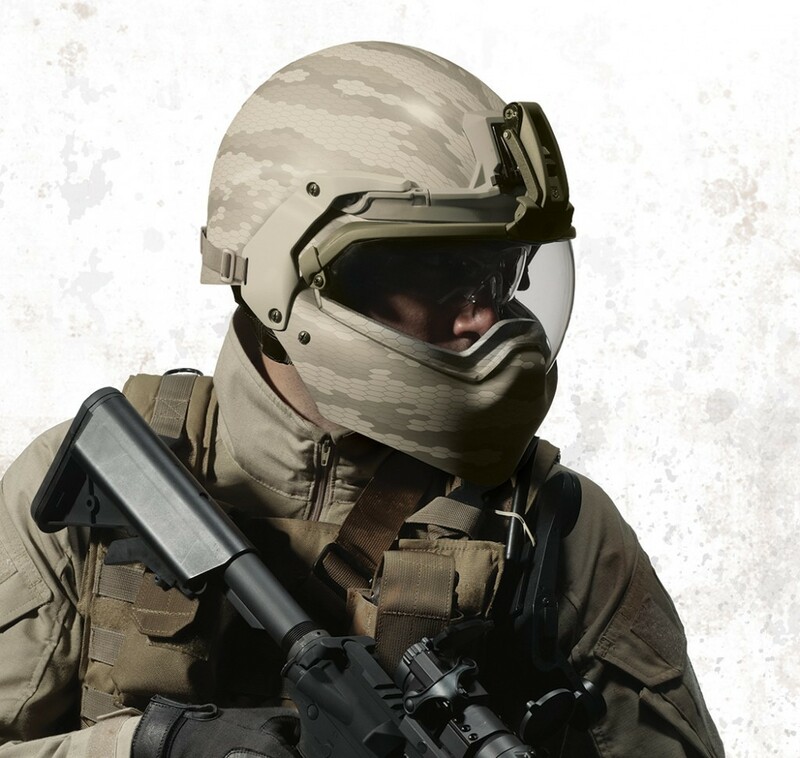 The first fully integrated and fully modular solution of its kind, the Batlskin Head Protection System combines groundbreaking technology and design, with new materials and innovative processes to deliver an all-new ballistic helmet shell, trauma liner, front mount, retention system, mandible guard and visor. The result is a single, fully integrated system that provides excellent protection from blunt force, blast and ballistic threats, with a lightweight wearability for peak performance. "The product of several years of research and development work, we’re proud to introduce the Batlskin system at a critical time. The unfortunate reality is that wartime head and face injuries are at an all-time high," explains Jonathan Blanshay, CEO of Revision. "The Batlskin Head Protection System not only makes radical leaps forward in helmet and liner technology; its integrated visor and mandible guard could also greatly reduce the incidence of traumatic brain injury (TBI) in blast situations. At the same time, the modular and scalable nature of this system provides soldiers with the unique ability to quickly armor-up and -down as the threat environment dictates." The Batlskin Lightweight Helmet uses advanced shell technology to achieve weight reduction while increasing ballistic performance. Its rigid construction is engineered to withstand blunt force, blast and ballistic threats. – Hybridized layers of materials bonded through innovative manufacturing processes provide the next generation of combat helmet shells. – Enhanced ballistic performance, at minimum 20% lighter than current shells for long-wear comfort. The Batlskin Impact Liner uses dual foam technology for superior fit, comfort and impact absorption. Its multi-level design allows for cooling and stability while shim pads afford a custom fit. – Lightweight, sweat-wicking materials offer superior comfort and wearability. The Batlskin Ergonomic Retention System employs one-handed adjustment buckles for ease of use and straight-line-force design for stability—even with night vision equipment. – Comfortable nape pad and cabretta leather-lined chin strap allow for superior wearability. The Patented Batlskin Multi-Purpose Front Mount allows for the rapid attachment of protection enhancing devices such as the Batlskin visor and mandible guard. Ingeniously, it also doubles as a universal NVG mount with a lightweight and durable construction for modern-day battlefield use. – Provides excellent stability for NVG use and other surveillance devices. – Core piece that seamlessly integrates Batlskin visor and mandible guard. The Batlskin High-Threat Mandible Guard provides lightweight blunt force, blast and ballistic protection for the lower jaw. Its durable, low-profile design is engineered for rapid attachment and removal while on the fly. The Batlskin Three-Position Visor provides blunt force, blast and ballistic protection, flawless optics and maximum field-of-view. Designed for quick donning and doffing while on the move, it is scratch, fog and chemical resistant. Revision’s Batlskin Head Protection System makes its European debut at DSEi, taking place at the ExCeL London Centre in the UK, September 13-16, 2011. Its North American unveiling will take place at the AUSA Annual Meeting in Washington, DC, USA which runs October 10-12, 2011. ABOUT REVISION: Revision develops and delivers purpose-built protective equipment for military use worldwide. The company, which began with eyewear, has expanded to face and head protection and continues to develop their capabilities for integrated, performance-enhancing soldier systems. To that end, Revision brings the most advanced expertise, state-of-the-art facilities and finest technical minds. Clients include the U.S. Department of Defense, the Canadian Department of National Defence, the Netherlands Defence Materiel Organization, the German Federal Defence Force and the UK Ministry of Defence. Privately owned and ISO 9001:2008 certified, Revision’s operational headquarters is located in Essex Junction, Vermont, USA, with additional offices in the Netherlands and Canada. For more information, visit www.revisionmilitary.com, write [email protected], or call +1 514.849.1874."